O be joyful in the Lord, all the earth; ♦ serve the Lord with gladness and come before his presence with a song. 2 Know that the Lord is God; ♦ it is he that has made us and we are his; we are his people and the sheep of his pasture. 3 Enter his gates with thanksgiving and his courts with praise; ♦ give thanks to him and bless his name. 4 For the Lord is gracious; his steadfast love is everlasting, ♦ and his faithfulness endures from generation to generation Psalm 100 Glory to the Father and to the Son and to the Holy Spirit; as it was in the beginning is now and shall be for ever. Amen. We wait upon the Holy Spirit to gift us with renewing grace. We bear before you all whose situations prevent them from seeing Jesus (Pause) Come Holy Spirit. Thy Kingdom Come We wait upon the work of your Spirit as we say the Lordâ&#x20AC;&#x2122;s Prayer together: Our Father in heaven, hallowed be your name, your kingdom come, your will be done, on earth as in heaven. Give us today our daily bread. Forgive us our sins as we forgive those who sin against us. Lead us not into temptation but deliver us from evil. For the kingdom, the power, and the glory are yours now and for ever. Amen. 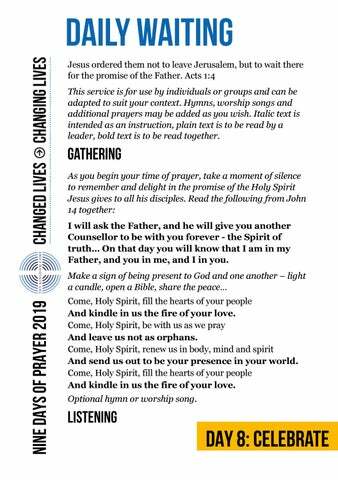 Come Holy Spirit: gift us with times of rejoicing Come Holy Spirit: gift us with space to reflect on the Good News Come Holy Spirit: gift us with people to share it with Come Holy Spirit: gift us with yourself.